You've probably watched enough mafia movies to know the Italian word for family — although you might not have realized it has a "G" in it! When you're talking about just one member of your family, or of someone else's family, you just strap the Italian word for "my", "your", "his", "her" etc (a.k.a possessive adjectives) onto the front. When there are multiple family members to talk about (plural), like aunts, uncles, brothers, sisters, children, etc, you need to use one of those Italian words for "The" (a.k.a definite articles). 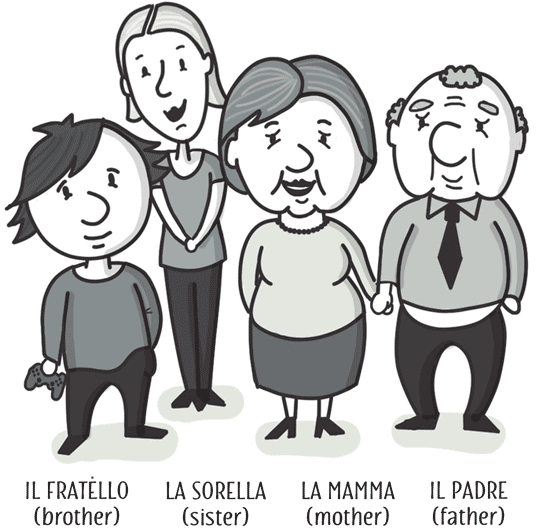 Here are some extremely useful sentences about families that you won't find in any phrasebooks. You don't call your mother "mother" unless you're mad, or super posh. Neither do the Italians.